His development of a radio telegraph system led to the establishment of many associated companies all over the world. Guglielmo Marconi was born in Bologna, Italy, on April 25, 1874. He was the second son of Giuseppe Marconi, a wealthy Italian landowner, and his Irish wife, Annie Jameson. He received his education privately at Bologna, Florence and Leghorn. As a young boy he was fascinated with physical and electrical science and studied the earlier mathematical work of James Clerk Maxwell, the experiments of Heinrich Hertz and research on lightning and electricity conducted by Sir Oliver Lodge. Marconi was convinced that communication among people was possible via wireless radio signaling. He started conducting experiment in 1895 at his father’s home in Pontecchio (60 kilometers southwest of Venice), where he was soon able to send signals over one and a half miles. During this period, he also carried out simple experiments with reflectors around the aerial to concentrate the radiated electrical energy into a beam instead of spreading it in all directions. In 1896 Marconi traveled to England in order to get a patent for his apparatus. Later that year he was granted the world’s first patent for a system of wireless telegraphy. After successfully demonstrating the system’s ability to transmit radio signals in London, on Salisbury Plain and across the Bristol Channel, he established the Wireless Telegraph & Signal Company Limited in July 1897. This company was re-named as Marconi’s Wireless Telegraph Company Limited in 1899. 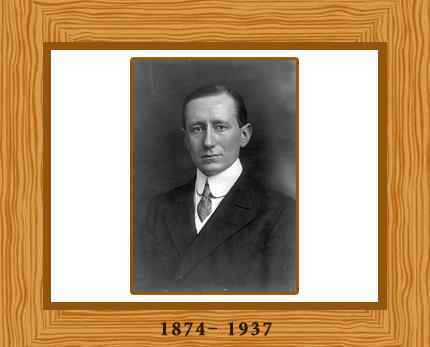 During December 1901 Marconi proved that wireless signals were unaffected by the curvature of the earth. He transmitted the first wireless signals across the Atlantic between Poldhu, Cornwall and St, Johns, Newfoundland, a distance of 2100 miles. The next year he demonstrated “daylight effect” relative to wireless communication and he also patented his magnetic detector, which became the standard wireless receiver for many years. In December he successfully transmitted the first complete message to Poldhu from stations at Glace Bay, Nova Scotia and Cape Cod, Massachusetts. In 1905 Marconi patented his horizontal directional aerial and in 1912 he patented a “timed spark” system for generating continuous waves. In 1914, he took the position of a Lieutenant in the Italian Army. Later he was promoted to Captain and in 1916 was appointed as a Commander in the Navy, receiving his Italian Military Medal in 1919 for his war service. He also used his systems for military endeavors. Continuing with his experiments, he established the world’s first microwave radiotelephone link in 1932, and later he devised the microwave beacon for ship navigation. Marconi died in Rome on 20 July 1937, aged 63 following a series of heart attacks.